It's almost time to show our Mummies how wonderful they are. This Sunday is Mother's Day in the UK. 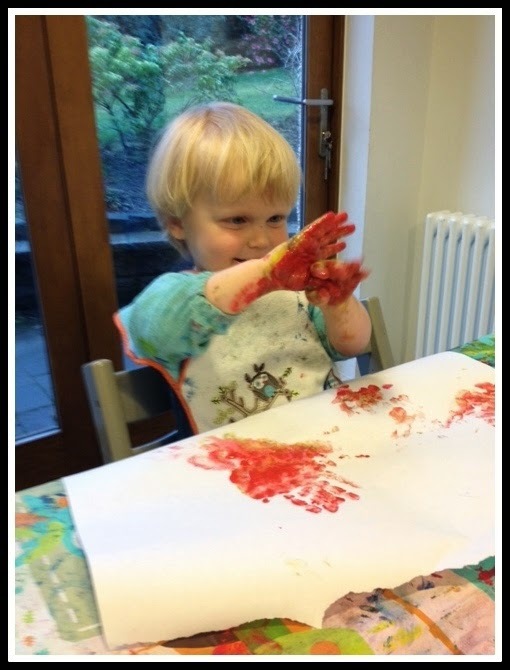 I've come up with some plant and garden related fun activities you can do with your Mummy, some places to take her and treats you can make to show her just how special she is. 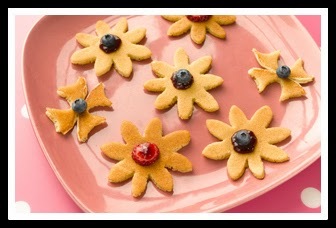 Let your mummy have a little bit more sleep and make her breakfast in bed. You could get someone to help you make her some toast or cereal or even pancakes. For a very special breakfast you could cut out shapes like flowers or love hearts in her toast or pancakes. 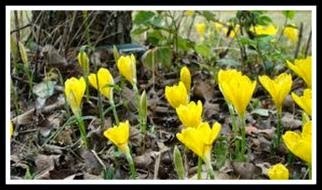 You could on a scavenger hunt in your local park or forest and see who can find the most yellow crocuses, purple muscari or maybe even an early daffodil. 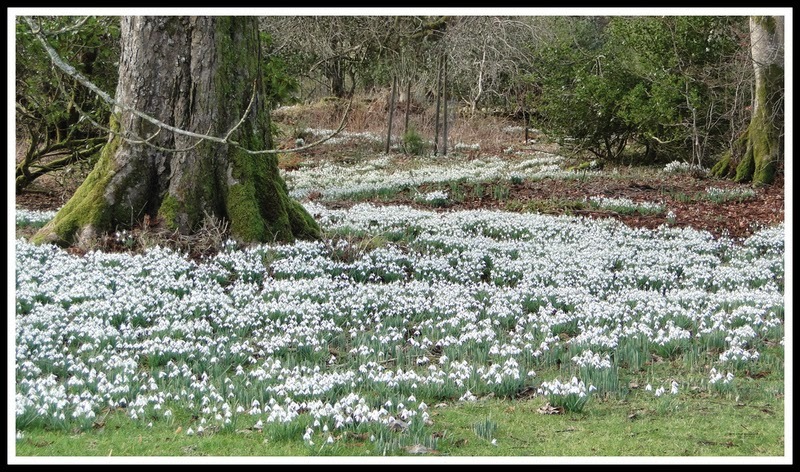 The woodland trust has a fab list of some flowers you could see at different times of the year. Snowdrops are still blooming so you could take your mummy to a snowdrop garden. There are loads of them all over Scotland, have a look here to see if there is one near you. 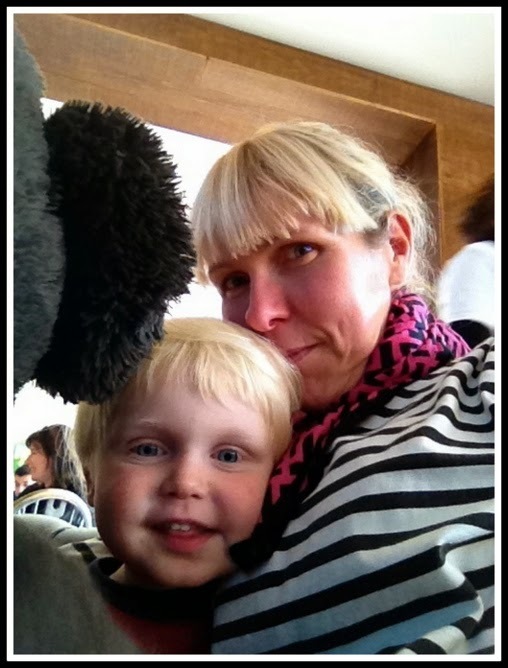 You could set up a Mother's Day treasure hunt for your mummy. Place lots of clues around the house and garden and lead her to a treat such as her favourite magazine or a box of chocolates or even a bottle of bubble bath hiding in the bath tub! You could treat your mummy to yummy treats on board a steam train. 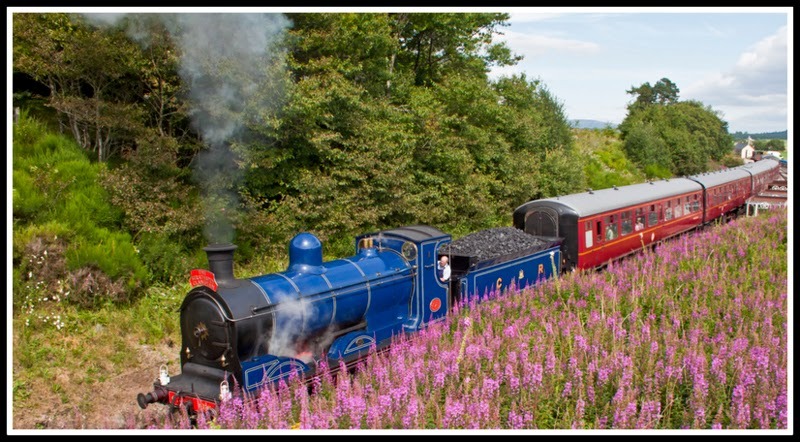 Mother's Day special afternoon teas are being run at the Strathspey Railway in the Cairngorm National Park. Otherwise the Bo'ness and Kinneil Railway offer afternoon teas most Saturdays and Sundays. Why not play i-spy out the window at all the trees and animals you can see from the train? If you live near Aberdeen you can take your mummy along to the Mother's Day Country Fair at Aden Country Park. There will be lots of goodies to treat your mummy to, music to dance to and even some birds of prey to meet. 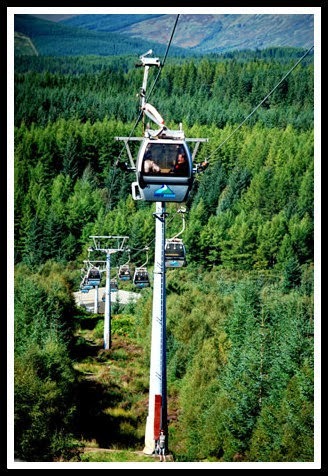 Or if your mummy is more adventurous you could take her on a gondola ride up the Nevis Range of mountains and have afternoon tea in the Snowgoose restaurant up on Aonach Mor. Perfect for re-fuelling after a forest walk along to the Meall Beag Viewpoint (via the play park of course). Look here to see the HUGE number of different plants you can spot among the way. of the wildlife from up here! If you'd like to explore some gardens and have a paddle in the sea AND eat yummy afternoon tea you could go to Culzean Castle and Country Park and have their special Mother's Day afternoon tea. Mummies always like a bit of artwork to brighten up the house. And they like flowers. So I made a handprint bouquet to give to my mummy. 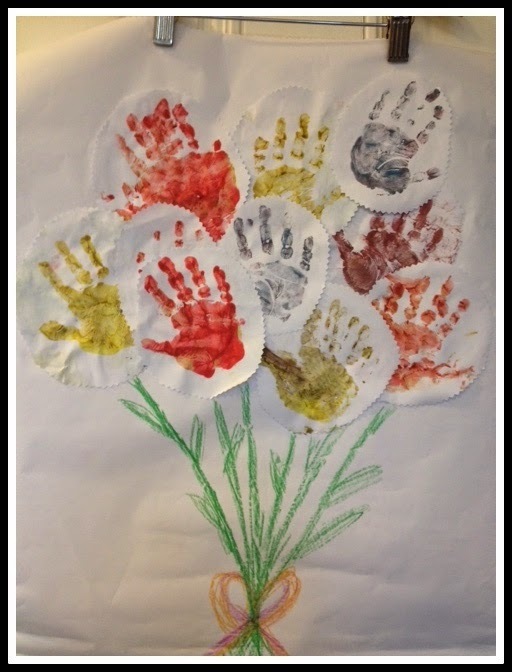 If you're a bigger boy or girl you can do the handprints directly onto one pice of paper in a bouquet shape. But for youngsters like me it's easier to do them separately and then get an adult to cut them out and help you stick them together. Then just draw on flower stems and a big bright bow. Squelching the paint is the best bit! 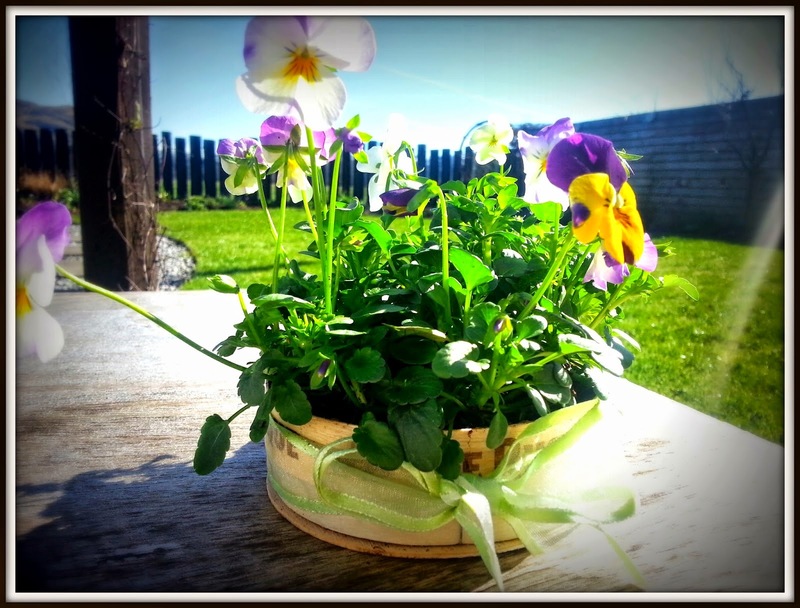 Or you could make the pretty pansies planter from an upcycled cheese box that my BFF Lulu showed us last year. Pretty pansies and you get to eat a whole lotta cheese! What's your favourite idea for making your mummy feel special this Mother's Day? I'd love to hear if you have other fab ideas.